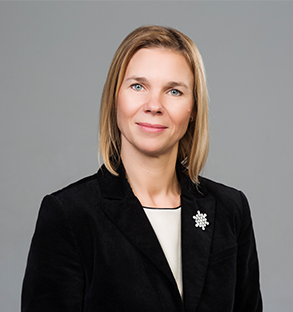 Riia Sillave is holding the position of CEO for Rail Baltic Estonia, one of the three implementing companies for the Rail Baltica project. Her extensive knowledge of project management she has gained from the launch of the greenfield BCTMP pulp mill AS Estonian Cell with the startup date of 2006 – the biggest foreign investment to Estonia, being the first employee and Member of the Management Board. From 2012 to 2017 she was employed in the headquarter of the shareholder of AS Estonian Cell being the Chief Financial Officer of Heinzel Group, a major pulp and paper production and sales corporate group in Austria. During her career previously, from 1997 until 2004, she has worked also as Controlling Manager for the headquarter of the German automotive company Webasto Thermosysteme GmbH in Stockdorf near Munich, Germany. Returning to the home country, she has joined the Rail Baltica project in December 2017.